Punch Bowl Social brings classic entertainment and real culinary chops together under the same roof, in an environment that is playful, comfortable and surprisingly intimate. Punch Bowl Social’s scratch kitchen serves upscale diner-inspired dishes while the bar focuses on delivering top-notch craft beverages. 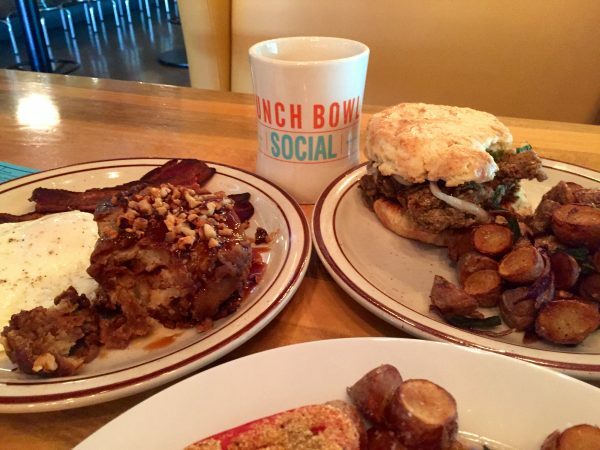 In addition to receiving dozens of awards since opening the first Punch Bowl Social in 2012, Punch Bowl Social was named one of Nation’s Restaurant News’ “Top Ten Breakout Brands” in 2015. I will start with the food and fill in with all the fun stuff at the end. We tried the Crispy Chicken Biscuit. 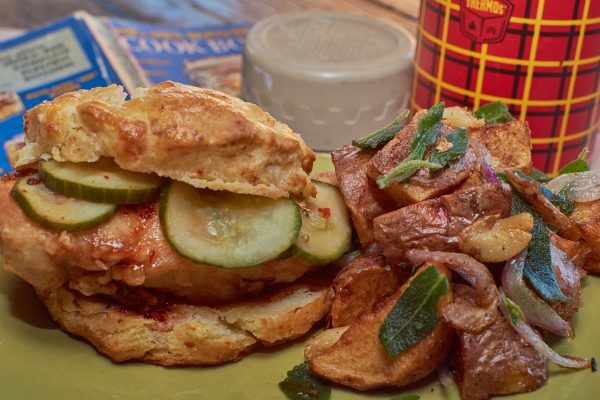 Zagat just rated this in their “14 Must Try Fried Chicken Dishes Around the U.S.” I loved the bread and butter pickles on this fried chicken because it set it apart from others. The biscuit was also very good. I can easily see how this one made the list. We also had the Quinoa Hoe Cake Benedict. For starters the hollandaise sauce was amazing. Just the right amount of lemon. This is a big one for me. The eggs were poached perfectly. The quinoa hoe cake that they were on was different than anything I have ever had before. I liked it. The potatoes that came with it where spectacular. Our final dish we tried was the Monkey Bread French Toast. Sticky, Gooey Brioche Bread with salted Caramel and Candied Walnuts. It was a big piece of gooey goodness. Very, very well done! This place is big, but food is served throughout. There are also bars throughout. If you can’t find something to do then you just aren’t looking hard enough. 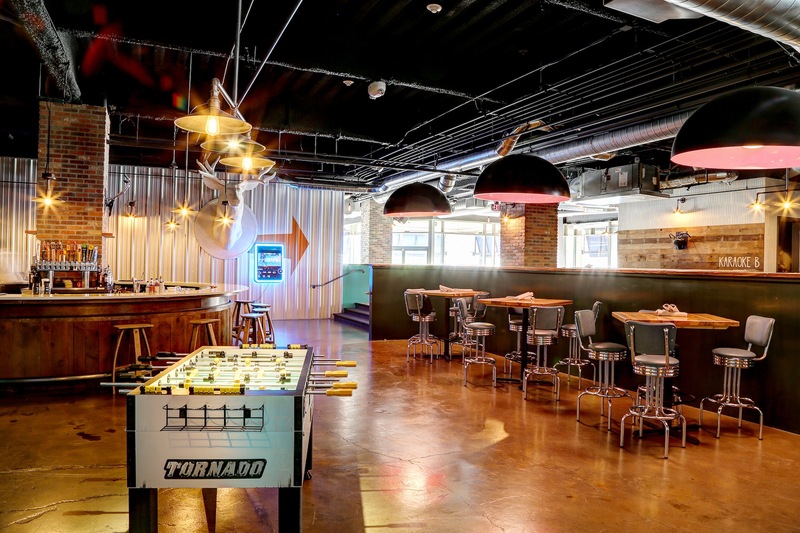 They have bowling, ping pong, shuffleboard, darts, marbles, board games and karaoke. Even though it is on the 3rd floor of the mall they even have some outdoor seating, which I love. Atmosphere was outstanding. There are booths, barstools, couches and all kinds of areas to make yourself at home in. Pricing on food was great. 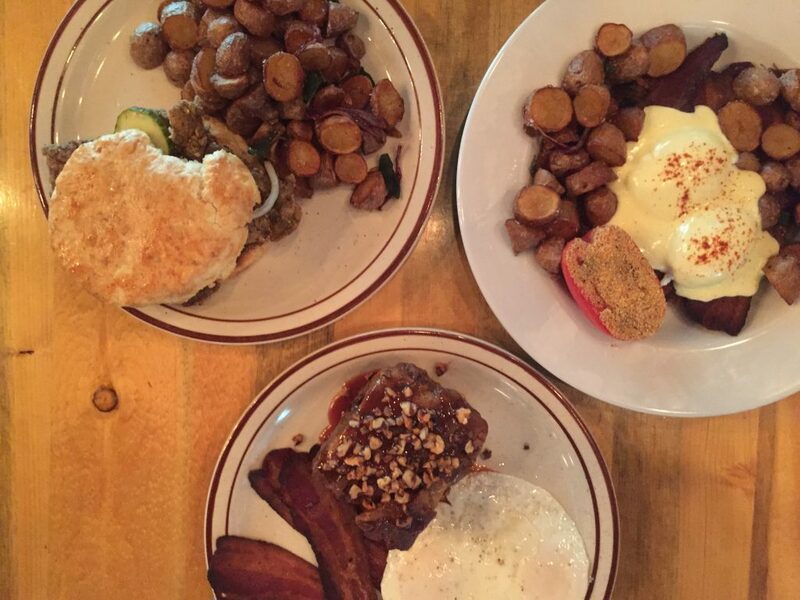 Brunch was right around $10-$12 per entree. Drinks are served throughout and they have hand crafted cocktails and draft beer. Not to miss item would be the Crispy Chicken Biscuit and the Fried Hominy, which they sent a sample home with us. Let’s just say those are addicting. Punch Bowl Social is located on the 3rd Floor of Pioneer Square Mall. 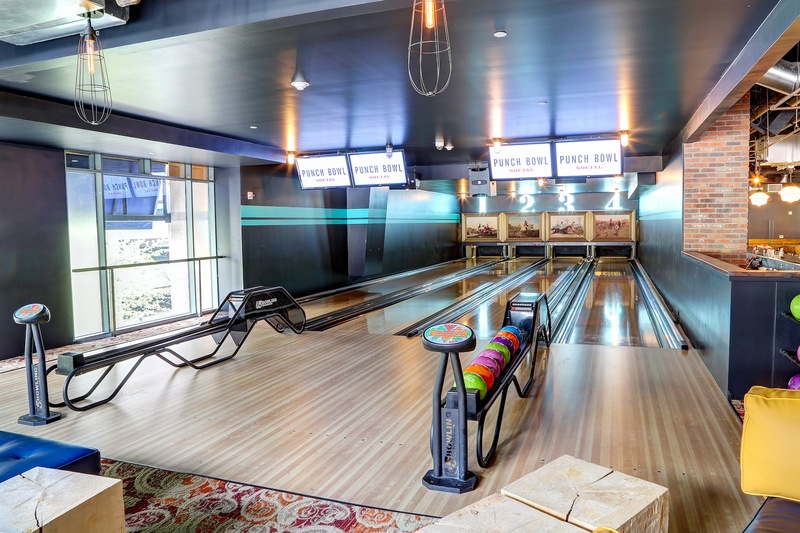 Thank you Punch Bowl Social for providing some great pictures.